Discussion in 'Firearms & Weapons' started by jburchett, Jun 12, 2017. Currently, my concealed carry is a Ruger LC9. It resides in an Alien Gear IWB holster. It's compact and rather comfortable. redneck_toy, Burnaz16 and mjones9630 like this. Depends how I'm dressed. Sometimes its a Ruger LCP in the pocket, other times it's a full size 1911 OWB. Other times a Glock 19. Sometimes a PPK. ZippoGeek, redneck_toy and Burnaz16 like this. Kimber Ultra Crimson Carry II in a DeSantis Cozy Partner IWB. Kahr PM9 in a Fist ultrathin Kydex IWB. redneck_toy and Slimhurricaine like this. S&W shield 9mm with a clip on the slide, carry it everywhere. If I need something for deep carry ( dressed up type) I carry a diamond back db9. Patrickh44231 and mjones9630 like this. I've been switching back and forth, from my Roland Special-esque G19 to my TRP Operator mostly. Every once in a while I'll still carry my old M&P9 though. You pick. For the most part, it's. My TRP Operator (bottom right) or my Kimber Raptor (upper left), buts it's usually one of these. Jim D, redneck_toy, Patrickh44231 and 8 others like this. Patrickh44231 and Rod707 like this. TBBCO LEAF LOVER likes this. It's good to see another Operator getting carried, what kind of holster are you rocking? I had a heck of a time finding anything that would work at first but a few awesome companies pulled through for me. Yeah, that was very difficult. 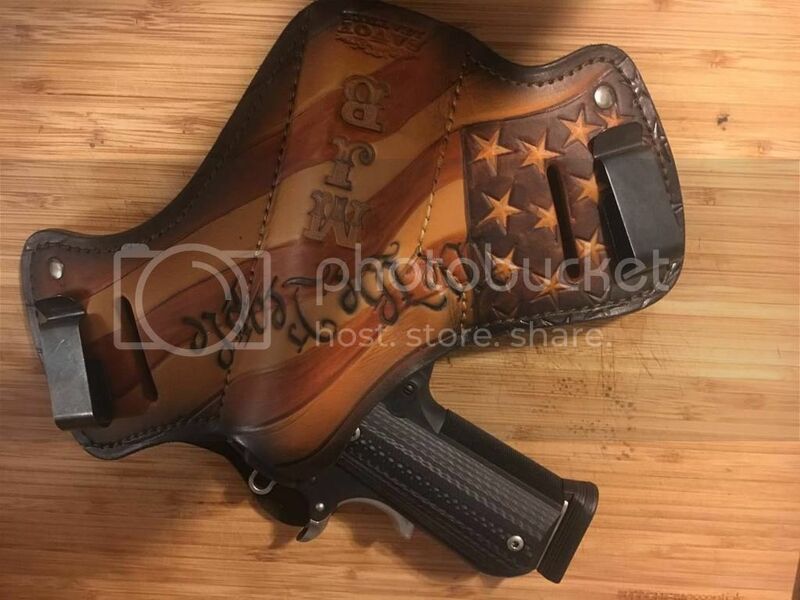 I mainly use holsters made by DM Bullard but they do not have a full rail mold, so I have to use one of their belt slide holsters or I use a holster made by Garrett Industries. 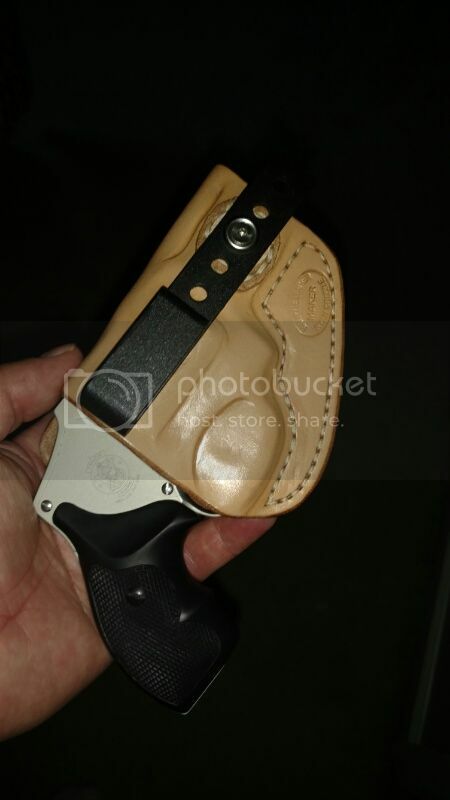 Theirs is a kydex holster but it is lined in leather. I like it because I can change the cant on it easily. As soon as I can find someone with a 3D printer, I will have them make a model of the TRP and get one made by DM Bullard. I could send them my gun, but it's a pain in the rear paperwork wise. Every other gun, I use the DM Bullard stuff. Works perfect for me and is built to last. It's usually my Kimber or if I'm lazy a Glock 42. Rod707, BrewinHooligan and CVAC085 like this. Btw- The cigar was terrible could of guessed from the commie label. BenS, daleo8803, Angry Bill and 1 other person like this. Patrickh44231 and Hoshneer like this. daleo8803, Rod707, BrewinHooligan and 1 other person like this. I'm back to a makarov in .380. I have a shield in 9mm, but am selling it. I can't seem to shoot it as well as I'd like. It carries wonderfully, but I'm done trying to teach myself how to shoot it better. I will put the funds towards a new ccw. daleo8803, Rod707, CVAC085 and 1 other person like this.